Recently, my husband C and I were asked to help out at a PCA event at Grattan Raceway. Instead of taking the racecar, trailer and swag, we decided to keep it simple by driving up in the Cayman. The day was overcast and it rained on and off throughout the event, which helped keep things cooler and more interesting for drivers. One of my favorite things to do when I am at the racetrack is to get a ride from my husband, both because I love watching him do what he loves, and because every time I ride with a great driver I learn something new. When he offered to take me out in the Cayman as the rain was starting, I eagerly agreed, strapped on the helmet, and hopped in. Rain is one of those things folks at driver’s education (DE) events aren’t really fond of because water makes racetracks change. The places where drivers have diligently trained themselves to put the car lap after lap can become the most slippery, requiring them to drive the rain line* or slow down considerably, which very few drivers ever want to do at track events. But rain also offers an excellent opportunity to drive on unexplored parts of the track while practicing smooth throttle and brake application, car control and steady steering inputs. The unpredictability offered by the elements forces the driver to skip repetition and focus on discovery, exploration and feel. If a dry track is like your life working out just fine, with a few ups-and-downs and the occasional scary moment, a wet track is like those inevitable moments in life when everything starts going awry and you have to keep going, hold on, and trust that if you stay the course, you will get to where you’re supposed to go—even if it takes a little longer, requires you to explore alternate ways to get there, and maybe even spin in the process. C got on track just as the rain started to fall, which tends to be when the track surface is most unpredictable. As we approached the turn 1 brake zone, the lack of grip in the usual race line was obvious. “It’s pretty treacherous out there,” he said, and as we slid well past the usual apex, I agreed. The newly-applied sealer was especially slippery, and the car was moving quite a bit, sliding in turns and brake zones and regaining grip with a not-so-subtle rear-end dance. One of the cool skills you develop as you learn to drive on track is the ability to “read” the track surface and a car’s behavior on it. With this information, you can better anticipate what the car is going to do and work at finding a balance between pushing, braking later and less, and avoiding agricultural excursions. * The better the driver, the more subtle the signs he or she can sense during on-track driving, and the more efficient the corrections he or she can issue. During my ride with C, I was focused on taking in all sorts of feedback from our car as it was being driven at the limit. I was also paying attention to what the driver was doing to correct the car’s trajectory when we slid past the turn-in and experienced understeer and oversteer. Plenty of times when we entered a corner at speed, I’d feel the lack of grip, and the car would start to rotate; C would catch it, find where the grip was and return to power very quickly. What is possible when you develop and hone your skills will surprise you. Yes, some people are born talented, and talent does exist, but the story we tell ourselves—that people just step into something and are magically excellent at it right away—is not really true. While my husband is a gifted driver, I have also seen him work on his skillset relentlessly over the last 8 years. He has driven lap after lap pushing himself to go faster. He has looked at data, thought about it, gotten out on track and worked on fine-tuning corners. He has explored driving techniques which have and have not worked for him, but he has not shied away from experimentation. He has asked drivers and driver coaches he respects for their feedback and accepted their counsel. He has had great race weekends and disappointing ones. But when I look at the characteristics of how he has gotten to the point where he can jump in our street car with street tires and drive it around a wet track without any semblance of fear, I see the same characteristics any person who is passionate about something employs to get there: he has done the work and stayed the course. Has it been easy? His natural talent probably helped, but only so much. The rest has just been hard work, week after week, year after year…and he is still going at it. (As you read this, he is probably looking at in-car data). In-car data analysis keeps no secrets. As I was processing what the car was doing on the rainy track, I noticed that although both C and I were sensing the lack of grip, he was taking less than a second to evaluate, make corrections and return to full power. I instinctively knew it would have taken me a few moments to collect myself, regain my confidence and trust that it was time to go back to full power after a big slide. I’m the kind of driver who is fond of keeping things safe. I am very unlikely to try new things on track without first knowing that I will be able to keep the car under control. On the surface, this seems like a good thing, right? Unfortunately, what keeps me safe has also sometimes kept me from becoming a better driver and from being more of a go-getter and risk-taker in life. On my ride, I noticed C constantly testing the limit of grip at different parts of the track and adjusting the demands he made of the car on consecutive laps. Sometimes his risk-taking meant a faster lap, and others it didn’t – but the constant exploration made for a great learning opportunity. I am not suggesting that you start being reckless on track (or in life). But the times I have managed to push myself a bit outside of my comfort zone have also been the times that I have stumbled, recovered, and learned a great deal about what I could (and could not) do. Being brave and taking calculated risks help us grow, whether we fail or succeed. The last time I spun on track, I spent the greater part of the day thinking about what I’d done wrong. I sat out two sessions while I re-played every bit of what led to my spin in mental slo-mo instead of going back out and applying what I had learned (lifting in a high-speed corner when the track is wet is still not such a hot idea). Many years ago, I asked my brother (a.k.a. I don’t let the elements dictate whether I drive or not) how he had become so fearless driving in the rain. “I used to wait until it would start raining and take the car out to a fast corner in the middle of nowhere and I drove it over and over,” he said. “I went off so many times I lost count. And then I stopped going off.” What really matters is not how often you make mistakes, but what you learn from the experience and how quickly you recover and get back on track. The more we practice integrating a lesson, the better we get at it, and the less time we spend dwelling on mistakes and learning from them instead. In the car, the more we practice recovering, the faster recovery happens. One of the reasons why I love performance driving is that a race track offers you a chance to do better on every lap. Drive turn 3 poorly? No worries, it’s coming back up in 1.5 minutes or so. Drop a wheel while trying something new at the hairpin? Shake it off and carry a little less speed in that spot the next time. 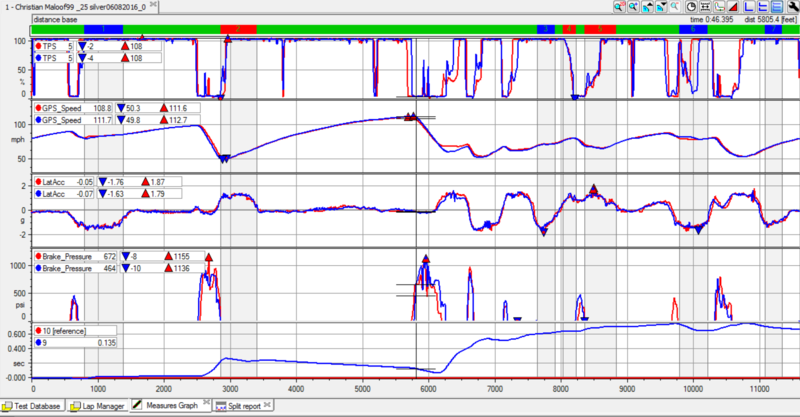 But with the repetition, there can also come over-analysis, especially if you have access to in-car data. 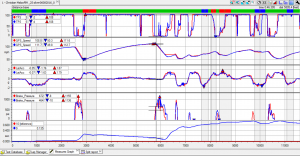 On our track days, the moment the drivers are out of the car, the laptops pop open and the data analysis begins. We pore over roll speeds, brake application and predictive laps. Data provides the most objective driving teacher you will ever have, which is good and bad – good because there is no opinion involved, bad because it’s easy to drown in the very little things we should be doing in the car. But all that data, analysis and advice means nothing unless you get out there, drive and integrate what you’ve learned. Recently, our daughter was learning to do turns at her skating lesson. Afterward, I asked her what kinds of instructions her teacher was giving her to help her master the new move. “She explained the turn and told me to stand up straight and push away,” V replied, “but just like in soccer, it works better when I don’t think about it too much and just let my body do it, Mom.” Yeah, my brilliant 11-year-old has already figured out what has taken me four decades to learn: instructors can tell you what to do in a million ways and you can tell yourself the steps in another million, but in the end, you just have to let it all seep into your body and do it. In my husband’s case, he has an enormous ability to split data hairs and then get in the car and integrate learnings into his driving almost immediately. Every weekend we have spent at the racetrack, he picks something to work on and moves the bar up a little. This is not to say that he has not experienced frustration while working on things; he just focuses what needs to get done and wastes no time overthinking it. In contrast, I can be a complete over-thinker, which can get in the way of my driving (sometimes I have to kick my inner dialogue out of the car so I can just drive). The less I over-analyze and the more I just drive, the more enjoyable my time on track is. Feeling like a failure when we make a mistake or when we don’t see immediate improvement can be a huge hurdle to the learning process both on track and off. On a difficult race weekend when the podium doesn’t seem within reach, it is hard for C to see just how far his driving has come. Like all of us, he expects to do better each time he gets behind the wheel, and naturally that is not always the case. It is hard to trust that there is learning and progress going on even when things are not working as planned or when we hit a plateau. But if we stay the course and keep working on what matters to us, we almost always eventually see results. My ride in the rain reminded me that no good things come without hard work, commitment and patience. And that if you stay the course in things that matter to you, the likelihood that you will learn, improve and enjoy is pretty high. * The rain line is the modified trajectory a driver wants to follow to ensure the most grip possible in wet conditions. Often, but not always, the rain line is off the race line, which tends to be polished down and therefore offers the least grip. ** An agricultural excursion happens when you go off track and onto the grass; also called mowing the lawn and going agro.